Using Natural stone walls in your landscaping can help soften the look of your garden beds. Natural stone walls can look less industrial than precast concrete walls and the costs are typically similar. The applications for natural stone are endless. They can be used for small or large retaining walls or decorative walls or feature garden beds and planters. There are many options when it comes to natural stone wall materials. We often use Rundle stone for many of our natural stone features and walls. Rundle stone comes in several different sizes including large boulders, pre cut steps, 2-3 inch and 3-5 inch. Rundle stone can be found in dark grey tones as well as brown. Rundle is readily available because the quarry is located in Canmore, Alberta. 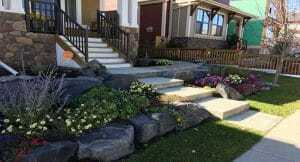 Many other natural stone options are available from quarries all around North America. Click here to have a look at more natural stone options.